Over the past five offseasons, we’ve compared quarterback strength of schedule to everything from Egg McMuffins and McRibs, to inexact science and the search function on GamePass. The most common and relevant analogy, however, has been to a puzzle piece. Projecting strength of schedule is simply an attempt to gather more information, with which we can make better decisions. It is not the end-all of fantasy quarterback prognostication, and despite straw man arguments to the contrary, nobody claims it is. Fantasy gamers project the output of specific offensive players, as well as entire units. We base our views on personnel, scheme, opportunity, and past performance. Attempting to judge defenses is no different, and it’s entirely worth our while. As the season unfurls and new information presents itself, we adjust our expectations – exactly as we do for offenses. For now, we leverage what we’ve got. As with any forecast, we can be most confident in which teams will wind up at the extremes – the very best and worst pass defenses – and should direct the majority of our focus there. It makes more sense to plan around the Jaguars being good and the Colts being bad than it does to guess how the Packers and Panthers will do. 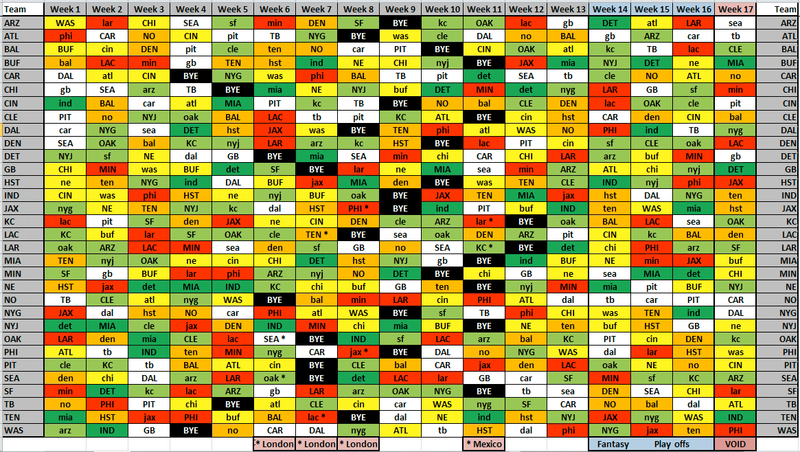 The strength of schedule grid below will be our guide, as always. More weight should be given to the pass defenses shaded red (hardest), orange (next-hardest), green (easiest), and light green (next-easiest), than to the yellow (neutral-hard) and white teams (neutral-easy). As injuries and performance fluctuations occur through the summer and fall, the designations will change. Fantasy points allowed to quarterbacks in 2017 are only minimally weighted in our classification of pass defenses. Other factors include 2017 pass defense success rate, PFF pass rush and coverage grades, Mike Clay’s defensive unit rankings, and my 2018 pass defense rankings. The last two take into account offseason player movement, and were weighed more heavily when grouping pass defenses than the 2017 results. While last season’s performance is a strong jumping-off point, we must account for current situations for this exercise to be effective. Today we’ll have some first impressions of the strength of schedule grid, followed by early- and late-season schedule analysis on Tuesday (with an emphasis on early schedules), and finally, optimal quarterback pairings, bye-week analysis, and the search for this year’s Skeleton Key wrap thing up on Wednesday. The NFC East used to be the O.K. Corral of the NFL. High-powered and, for the most part, fast-paced offenses lit up scoreboards against overmatched defenses. Those days are gone. Even the Eagles operated at a bottom-half pace last season, and the Giants won’t sniff the tempo they played at in recent years. Perhaps their questionable defense pulls them into shootouts, and there’s at least a non-zero chance Eli Manning can keep up – but the rest of the division’s defenses are on the rise. NFC East teams also face improving defenses from the NFC South, and perhaps the league’s most rapidly ascending division: the AFC South. It’s been quite a ride down there since Andrew Luck last threw a pass in a game, but we’ll get to him later. The Eagles, who have “at large” games against the Vikings and at the Rams, will not have an easy road to defend their title upon. At least Carson Wentz doesn’t face Philadelphia’s menacing defense twice, as his division rivals must. Fortunately for AFC East members, they get to play six division games – although, if either the Patriots or Bills can find a pass rush, they’ll be far more daunting than last season. The non-division slate is a mixed bag, with AFC South pass defenses mostly challenging, and the NFC North mostly not. The real loser here is Buffalo, who also must face the Ravens on the road and host the Chargers to start the season, followed by a trip to Minnesota. It may be accurate to forecast early-career starts for Josh Allen in relief of his “veteran” signal-calling teammates. On the other hand, AFC West teams have a light non-division schedule, with the defensively depleted NFC West and mediocre AFC North accounting for half of their opponents. The Broncos and Chargers get the better side of the inter-divisional draws, facing the Chiefs and Raiders twice. At least Oakland has “at large” games with the Colts and at the Dolphins. The Chiefs instead deal with the secondaries of the Jaguars and Patriots. Kansas City’s Patrick Mahomes-led offense looks exciting, but they have their division’s toughest pass defense slate. The AFC South is suddenly a foreboding defensive division — well, outside of Indianapolis, of course. Even they are finally moving in the right direction under general manager Chris Ballard’s stewardship. 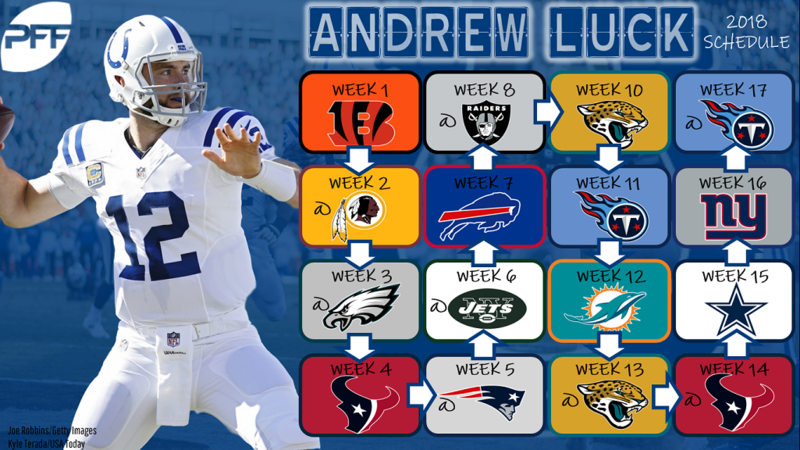 However, Luck returns to six games against promising-to-premiere AFC South pass defenses, and non-division opponents hailing from the AFC East and NFC East. Their “at large” games include a season-opening visit from the Bengals and a trip to Jon Gruden’s new Black Hole. The road will be rockier than the one Luck used to travel. While they each get to face the Colts twice, the schedule doesn’t shape up much better for the rest of the division. The Titans (Ravens at home and Chargers in London) and Texans (Browns at home and Broncos in Denver) get the toughest “at large” draws. Tennessee, in particular, has the deck stacked against them for what, by many other indications, should be a breakout season. The Titans head into their Week 8 bye on what may be the hardest six-game stretch any team faces all season. As the AFC South’s defensive profile rises rapidly, the opposite is true of the NFC West. Not too long ago, the Seahawks and 49ers set the defensive pace for the division and the league, with the Cardinals and Rams often holding their own. Now the Rams – who are, to put it mildly, all-in on 2018 – boast the division’s lone defense to reckon with. The 49ers are on their way back to respectability, and are surpassing Arizona and Seattle, but this neighborhood no longer qualifies as tough. Projecting out four months of an NFL season is hard. Doing it nearly three months before Week 1 is even dumber harder. Yet, we have a pretty good idea of which defenses are going to be strongest, or at least we think we can get close. With that in mind, a handful of offenses are dodging tough divisional matchups during the fantasy-irrelevant Week 17. While we won’t base many decisions on this during fantasy drafts, it’s still worthy of a brief footnote. Investors in Bears fantasy assets won’t need to worry about their trip to Minnesota. Week 17 also features the Broncos at the Chargers – both of whom should have strong pass defenses – to the relief of those who draft Philip Rivers and Case Keenum. The Jaguars host the Texans in what likely won’t be a pass-happy affair. One of Jimmy Garoppolo’s games against the Rams (on the road) gets washed away in season-long fantasy leagues, and Alex Smith against the Eagles also will only be in play for DFS enthusiasts.